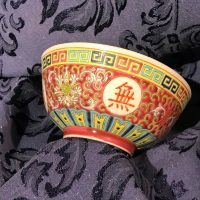 Small Vintage Porcelain Chinese Bowl. Decorated Exterior: 151,100 ppm Lead. That’s more than 15% Lead. 90 ppm Lead is toxic to kids.